There is one area of personal development that can make or break your self-esteem and your ability to have healthy relationships: it’s the ability to set and implement healthy personal boundaries. Personal boundaries are the imaginary lines we draw around ourselves to maintain balance and protect our bodies, minds, emotions, and time from the behaviour or demands of others. I was talking to someone about this recently after attending a Conference and then a dinner afterwards, when my internal voice had said “head for home; you need to preserve energy for tomorrow”. I likened it to a weighing scale, where we balance our own needs against the needs of others. and try and hold an awareness of both. Some people suggest that it is a foundation of good self esteem that allow us to set appropriate boundaries They provide the framework to keep us from being used or manipulated by others, and they can allow us to confidently express who we are and what we want in life. 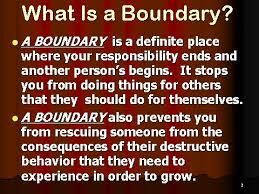 Without healthy boundaries or with very weak boundaries, we struggle to have healthy relationships. You give up a part of yourself to be available or accommodating. Or you become so entangled with another person and their needs that you lose your own identity. This undermines your integrity and leads to a loss of self-respect — and probably the respect of those around you. What makes it at times difficult to draw boundaries? Balancing our own needs with the needs of others certainly; maybe also fear?. The fear we won’t be loved, that we aren’t good enough or deserving enough just as we are, that if we give into that extra hour (when we really wanted to go home) we will have let someone down? Boundaries reflect more than our need for physical space. They include any aspect of our interactions with others, including our relationship with ourselves (for example avoiding self-sabotaging activities) and our environment (protecting ourselves from noise; as I get older and am out having meals at a busy restaurant, I sometimes struggle to hear all of what people are saying!). 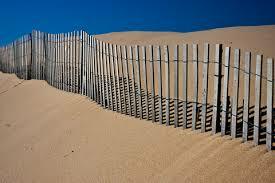 Boundaries reflect our core values, our respect for ourselves and our need for safety and protection. They include being able to say no and mean it, or saying yes and meaning it. They are a way we define ourself separately from another. They include material boundaries (whether you give or lend things like books, money, clothes), emotional boundaries (separating your own emotions and responsibility for them from someone else’s), physical boundaries (your personal space, privacy; do you handshake or hug?!) amongst others. I don’t know anyone in my circle of family, friends and work colleagues that doesn’t struggle with them sometimes trying too hard to “do the right thing”. · Allowing yourself to be interrupted or distracted to accommodate another person’s immediate wants or needs. When you hit these challenges over personal boundaries, its powerful to observe that these act of compliance, self-denial, or neediness chips away at your own self-respect, let alone the respect that others have for you. In a professional context, I feel I am fairly comfortable about setting boundaries. 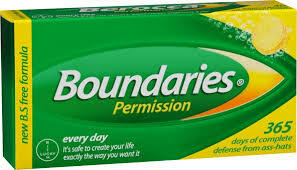 I have been in business as a free lancer for over 15 years, and have got accustomed to intuiting the situations on where to apply boundaries and when to be flexible about them. These days it’s the small things that I struggle with; sending out a set of dates to a client for a meeting or coaching session, and you spend 3 or 4 times chasing them to get it booked; you meet someone for a potential new piece of work and follow up afterwards, only for a read receipt and no response, sometimes for weeks; having to continually chase invoices is a small bug bear periodically. I do often go above and beyond the stated objectives of a piece of work, but accept it’s my responsibility if I do this, and in most pieces of work I do it feels important to get right, as the work is important. The one time the boundaries creaked and broke in work in the last couple of years was when Sally and I took on a joint project for a national organisation; I knew really from the first contracting meeting that it was going to be difficult and felt that the scope was probably too wide, that they wanted too much from the work. Over the next couple of weeks it kept getting wider and things changed every other day, and we realised that whatever we did wasn’t going to be right; a lesson in learning to listen to early intuition. It remains the only project in the last 10 years that we haven’t finished as amidst a lot of soul searching we pulled out in the first month. On a personal and family basis, setting boundaries comes up with relationships and how you work things out as a family; from as parochial a decision as who gets to watch what they want on TV of an evening, to decisions about pocket money and holidays; it feels like we get more of these right than wrong, and usually things go awry only when we haven’t been able to hear what each person wants from that night out, a family meal, a holiday or whatever; it’s when they haven’t given voice to the boundaries and you find out half way through they didn’t want to do that thing that its hard. All in all, creating and holding onto personal boundaries is a lifelong developmental and complex thing to do, and often easier said than done. A dollop of self awareness, listening to intuition, and learning to state our needs as well as balance the needs of others means that we can all get what we want more often than not. To walk or to run…? ?